2013 Dodge Avenger SE, Air Conditioning, Steering Wheel Audio Control! In a crowded field of bland mid-size sedans, this stylish Dodge Avenger offers something a little different. 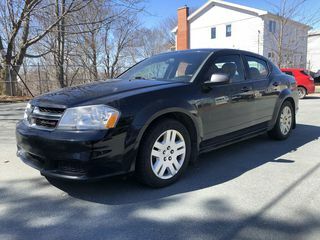 This 2013 Dodge Avenger is for sale today in Dartmouth. This Dodge Avenger rewrites the rules. Its bold style says sporty louder than it says sedan. An efficient, yet powerful engine echoes that sentiment. Its interior is both high-tech and high-comfort. Innovative features maximize its cargo-carrying capacity. Bottom line – get behind the wheel because this Avenger is a must-drive, must-own car. It has a 4 speed auto transmission and is powered by a 173HP 2.4L 4 Cylinder Engine. Interested in this 2013 Dodge Avenger SE?